Elderly Kamunabai Markam is bent over a puddle of water in the hot afternoon sun washing lotus roots she has collected after a day of backbreaking work. “Where are you going to take me?” she asks as a Down To Earth photographer clicks her picture. “To jail? I am all right with it if you give me my meals, so don’t try to scare me.” About a dozen men and women working nearby murmur their support. Their reaction is the result of the Maharashtra forest department’s efforts to stop extraction of lotus roots (locally known as bhishikanda) at the Navegaon Bandh reservoir in Gondia district. The move has jeopardised the livelihood of some 2,000 families, most of whom belong to the poverty-stricken Dheevar fishing community. Lotus roots are an important dietary supplement for the community and provide them food security (see ‘Roots crucial to local diet’ on p47). While the department says its actions are part of conservation efforts, the community alleges the department has been acting under pressure from powerful Malgujar landlords. These landlords claim to be conservationists, but want to employ the poor as labourers in their summer paddy fields, say people in the area. The forest department’s efforts to stop bhishikanda extraction is based on a government resolution issued in 1985. The resolution calls for a ban on the auction of khus grass (vetiver) and lotus roots by the irrigation department to prevent damage to the environment. But the resolution only bans auction, and does not refer to extraction by the people. “Initially, conservation groups argued that root extraction was harming the food base of water birds,” says Manish Rajankar of Bhandara Nisarga Va Sanskruti Abhyas Mandal, a Gondia-based non-profit working among the fisher community. “When it was pointed out that the roots are three feet underground, they argued that the plants were bird habitat.” But root extraction takes place only during summers, while “aquatic birds, both native and migratory, breed during the monsoons, when there is nothing to extract,” says Rajankar. Pramod Panchabhai, assistant conservator of forests of Navegaon Bandh, admits there is no scientific evidence of lotus root extraction harming any bird species. The department’s action is based purely on the abstract premise that human interference harms natural ecologies. Panchabhai also admits that the forest department has no authority to prevent people from extracting because the reservoir belongs to the irrigation department and is situated on revenue land. Despite this the department has posted guards at the lake to prevent people from extraction. Last year the department even seized a vehicle carrying roots, but later released it under pressure from people. The entire exercise, says Panchabhai, is being undertaken at the behest of people he calls “local naturalists” who have been egging the department on to “protect”the reservoir. “The department is simply taking advantage of people’s fear of persecution,” says Rajankar. “The reservoir is adjacent to the Navegaon Bandh National Park where people have been jailed for something as trivial as collecting a few mushrooms or bamboo shoots for food.” Villages such as Jambhli and Rampuri, where lotus roots are extracted, have lost their forests to the park, and their community forest rights have been ignored, he adds. 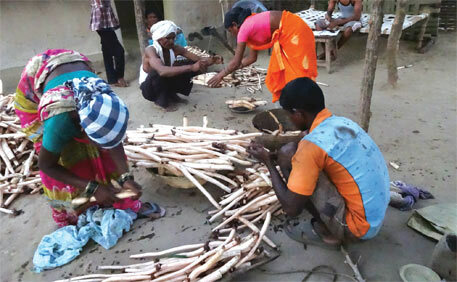 People say that the move to ban extraction came just one year after the villages around the reservoir formed self-help groups (SHGS) to market lotus roots to places like Rajnandgaon and Raipur in Chhattisgarh. Creation of SHGS removed middlemen from the business, enabling people to earn a good wage. “In 2012, SHGS paid Rs.15 per kg for lotus roots instead of the Rs.7-8 local traders were giving,” says Maniram Markam of Enodi village. “Around that time the landlords of our village, who have started a non-profit for nature conservation, started opposing root extraction,” he adds. Article 41 of the Biological Diversity Act, 2002, gives people the right to manage, regulate, charge royalty on and make sustainable use of bio-resources, based on equitable benefit sharing. However, gram sabhas are under pressure from powerful landlords who do not allow them to form biodiversity management committees (BMC), say people. As of now, only Rampuri village has formed a BMC. The reservoir comes under the jurisdiction of Navegaon Bandh panchayat which is dominated by landlords. “They are not allowing us to form BMCs and claim our rights as a community because they want to maintain their dominance,” says Tumsare. LOTUSROOTS are a popular delicacy in the tribal belt of eastern Vidarbha and adjoining Chhattisgarh. But for Dheevar fisher community, which specialises in managing and extracting this resource, it holds a special place as it provides them food security. "When we can't get bhaji (vegetable) we can bank on bhishikanda to provide us a tasty meal," says Kamunabai Markam who is involved in lotus root extraction in Gondia, Maharashtra. Fresh roots are eaten raw, or cooked with curry. Roots are also prepared as a sweet dish with mahua flowers. Finely chopped slices are parboiled, dried and stored for consumption during the monsoons. Dheevar families often store 20-25 kg of dried chips which are either fried crisp or cooked with curry. The root is rich in fiber, vitamin C, calcium and phosphorous, and low on calories and sodium. Dheevars consider it tasty and strength-giving. 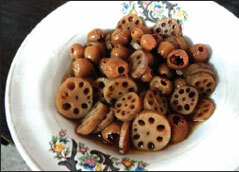 Boil lotus root slices in water and salt for 30-45 minutes. Drain the water. Add mahua flowers and a small amount of fresh water, and cook again till the flowers are soft and a thick, brown syrup has formed. If necessary, add a little more salt for taste. Serve as a sweet dish or with chapattis. Incomplete knowledge of so called local naturalists seems to be the trouble maker here. How Lotus root extraction is damaging the ecology of that area should be told clearly and then compare that with all that the other people- the forest dept, the naturalists and the Zamindars- are doing. So to say, building roads, buildings factories spewing toxic chemicals, driving cars and other vehicles emitting CO and what have we? Whom are we kidding here? As long as our stomachs are full, we can all become environmentalists albeit frauds and pretend to save the earth.